Today I had a wonderful breakfast with my mum, before we were taking new photos for tomorrow's article which has a sporty spice. Anyway, I wanted to spoil her with a sweet vegan but healthy dish for breakfast and decided for bananas, covered in pancake dough with nuts and oats, doesn't that sound super delicious? 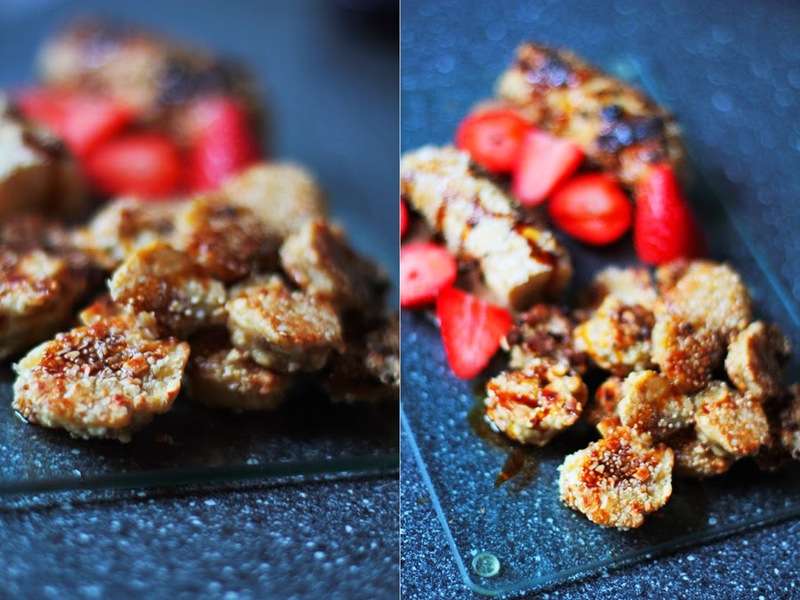 Well, then let's do it together in today's #cookwithmemonday and enjoy good food..
All you need is bananas, ingredients for the pancake dough you can find [ HERE ], coconut sugar, nut butter, cinnamon, cashews, oats and fruits for decoration, I used strawberries. First step is of course to peel the bananas. I used two for one serving but one can actually go with one for one serving, since this is really rich in carbs from the fruit sugar of the banana. I cut the banana and covered it with the pancake dough and then with the mixture of oats and nuts. I placed the covered banana in a pan with a spread of coconut oil until everything was brown-golden and crunchy. After all bananas were cooked I put it on a plate and added a sauce made of cashew butter and coconut sugar, so as vanilla and cinnamon. At the end I decorated everything with the fruits and served it warm. My mum just melted away for this breakfast. I hope you enjoy this meal, and give me some feedback after your first try. In the first place step is obviously to peel the bananas.you utilized two for one serving yet one can really run with one for one serving, since this is truly rich in carbs from the products of the soil sugar of the banana. that is a great way to make. You put it on a plate and included a sauce made of cashew spread and coconut sugar, so as vanilla and cinnamon. it is a great way.